As I've been going out, I've been self conscious of people staring at my face. Why? Because I've got a big red patch of rash on the side of my face. And an even bigger patch on my forearm . And some on my hands. I've been telling myself this is an exercise in humility, and reminding myself of Job and his boils, and trying to take positives from this situation. 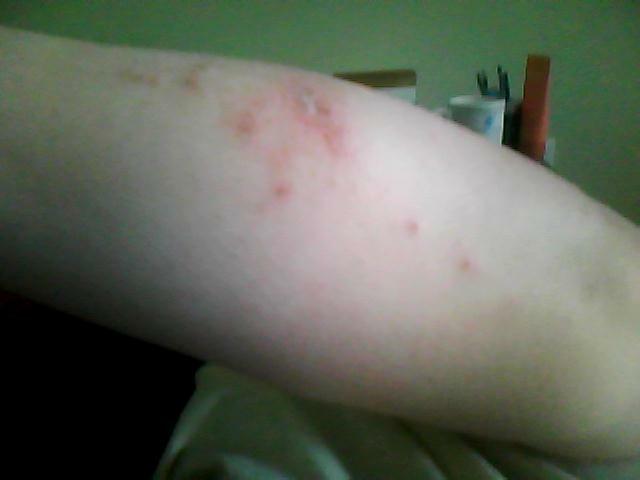 I've not mentioned it, but I have a poison ivy rash. A week ago, I picked blackberries for my blackberry cobbler. 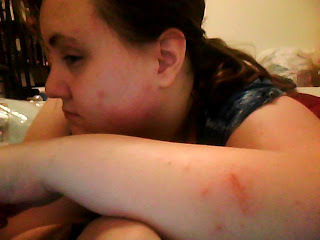 I scratched myself up, because of the blackberry thorns, but who cares about a few scratches, right? Two days later, I woke up with a huge rash where the scratches had been. We decided I must have gotten a few dots of poison ivy oil and my scratching and rubbing spread the oil, which I had not taken any care to wash off because I didn't know it was there. The next morning I woke up with it on my face. I realized I'd slept with my head on my arm. 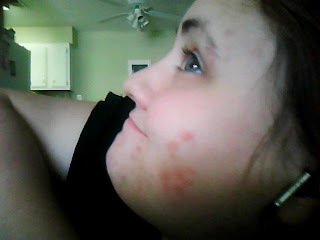 My rashes two days ago. So I washed my arm with rubbing alcohols over and over And my face. And my belly. Because in my sleep I'd rubbed my arm against my tummy. I rubbed off all the stuff I could think of. Then I left for Florence with Alison. After that first night, I woke up with a few more patches, but they looked more like little welts or bites than poison ivy so I thought it was some bug that had bitten me or something. The next day there were more. This morning I woke up, and there's suddenly some between my fingers and on the back of my leg. What?? Maybe this isn't poison ivy, I think. "The rash usually appears 8 to 48 hours after your contact with the urushiol. But it can occur from 5 hours to 15 days after touching the plant... The rash will continue to develop in new areas over several days but only on the parts of your skin that had contact with the urushiol or those parts where the urushiol was spread by touching." "Without treatment, the rash usually lasts about 10 days to 3 weeks. But in people who are very sensitive to urushiol, the rash may take up to 6 weeks to heal." SIX WEEKS? And I had NO IDEA it can take 15 days for stuff to show up. It's been 7. So I might keep having more show up every day for the next week?? "The rash is not contagious. You cannot catch or spread a rash after it appears, even if you touch it or the blister fluid, because the urushiol will already be absorbed or washed off the skin. The rash may seem to be spreading, but either it is still developing from earlier contact or you have touched something that still has urushiol on it." I've washed everything I can think of that may have touched it... but like I said, it was two days after my blackberry picking before the symptoms showed up. So I had two days to spread the oil all over me because I had no idea it was there (and it's resistant to washing off. Without getting it off, it can last up to a year on stuff). So who knows what the next few days will hold. Joy, right? I'm using Caladryl Clear and have tried wet compresses and benadryl. In fact, I'm still sort of drowsy from it. My arm right now. See how much worse it is than two days ago? And it looks wayy better than it did when I woke up because the benedryl is helping. (the light color in the middle of the biggest hive is lotion). My face right now. Which also looks much better than it did a few hours ago. It's also by my eyebrow, see? I do think it is poison ivy, or maybe poison oak. It fits. I easily came in contact with it. And the description of the rash matches it exactly. I looked up what other rashes look like poison ivy, and I can't see it being any other cause listed. Anyway, I thought I'd share... but now I should probably drag myself from my stupor and go back to trying to help Alison instead of feeling sorry for myself. I do not mean to complain, just to share. I try to have empathy, and this has given me insight into people having skin diseases, even though I at least know my own will be temporary. Love to all of you.